Justin Junior Mengolo, the exciting attacker of Panthère Sportive in the MTN Elite One 2010-2011, is obviously a player that the officials at the Fédération Camerounaise de Football have high hopes for. For the last 12 months, Mengolo has been frequently included in squads of the different national football teams and the speedy youngster has taken some major steps, becoming one of the most exciting players at the top level of Cameroonian football. In the season 2009-2010, Mengolo played for AS Sanaga, a rather unknown club that I believe is an amateur club from Yaoundé, the capital of Cameroon. A club called “Sanaga FC” played at the third level of Cameroonian football in 2008-2009 but I am not sure that this is the same club as “AS Sanaga”. AS Sanaga is the former club of Roméo Yem Yem, the promising winger of Astres de Douala. 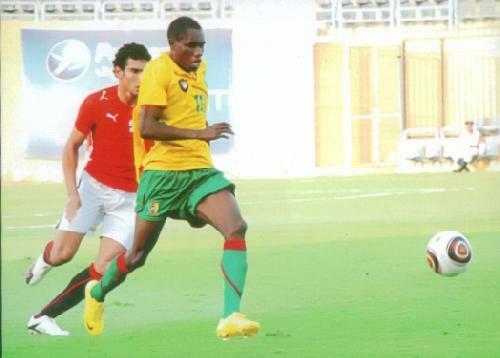 In July 2010, the rather unknown Mengolo was surprisingly named in the squad of the Cameroon U-23 national football team. It is not often a 16 year old player is picked for Cameroon U-23. Based on my knowledge of French, this means that “Mengolo is an attacker for the future who has to participate in many international tournaments to become as good as we expect. He has impressed everyone who have seen him play”. In October 2010, Cameroon participated in a friendly tournament in Venezuela, consisting of Venezuela, Trinidad and Tobago, Nicaragua, Ecuador and Panama. Venezuela and some of the other teams participated with U-20 national football teams but Cameroon apparently sent a national U-23 squad to the tournament, including Mengolo. In December 2010, Mengolo played for the Cameroon U-23 national football team in the 2010 UNAF U-23 Tournament. The tournament took place between 13.12.2010 and 18.12.2010 in Morocco. On 09.01.2011, Mengolo made his debut for Panthère Sportive in the MTN Elite One 2010-2011. On 23.01.2011, Mengolo scored his first league goal against Sable FC. In February 2011, Mengolo was included in the squad of the Cameroon U-23 national football team. Few days later, Mengolo was also picked for the Cameroon U-20 national football. Mengolo kept his place in the squad of the Cameroon U-20 national football team during March 2011 but did not make the final squad for the Orange African Youth Championship 2011 that was played in South Africa in April / May 2011. Mengolo scored his second league goal on 28.03.2011 against AS Lausanne. On 09.04.2011, Mengolo had a sensational match against Astres de Douala, scoring two goals. According to some sources, Mengolo scored a hat-trick in this match. However, according to most sources the third goal of Panthère Sportive was scored by Alain Rodrigue Djomou. As far as I know, Mengolo has scored four league goals for Panthère Sportive at the time of writing. Earlier this month, Mengolo was yet again included in the squad of the Cameroon U-23 national football team. Mengolo is described as a very speedy and lively striker who causes havoc with his enthusiastic style of play. He is definitely a player to watch for the future. The picture is taken from “Mybestplay”.